What's New? OFM Essentials Seating! The new OFM Essentials Seating collection provides comfort and visual appeal on a budget! This new line of executive chairs, mesh task chairs, and bar stools from OFM is an absolute winner. In today's post we'll highlight the seating from the Essentials collection to educate you on the benefits this trending new line has to offer. Enjoy! 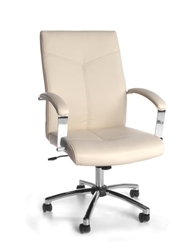 The OFM Essentials E1003 model chair is perfect for professional conference room and executive office applications. 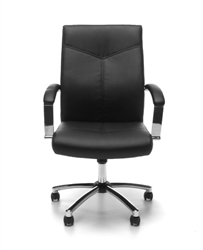 Available in black and cream upholstery options, the E1003 offers the same great look and feel of leather at a greatly reduced price point. Available for just $153.99, the E1003 is truly a bargain buy. These chairs are ready to support users up to 250 pounds and come standard with a wide 5 star base for improved stability in the workplace. 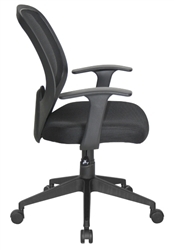 The built in lumbar support and tilt tension control help users find desired operational positions with ease. As an added bonus, these hot new chairs are GREENGUARD Certified! With it's generous dimensions and padded arms, the E1003 is ready to help your interiors become the supremely comfortable and equally stylish. OFM didn't stop at the E1003! 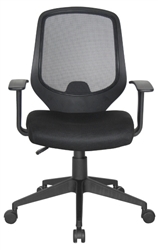 Their new Essentials collection also includes the super versatile E1000 mesh back task chair with mid back design. The E1000 is reliable, comfortable, and durable. 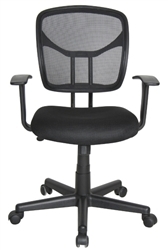 These affordable new chairs come standard with stain resistant black fabric seats and breathable mesh backs that will help you stay cool when working. A built in lumbar support feature and tilt tension adjustment are also standard attributes that make this chair an awesome buy at just $99.99. The OFM Essentials E1001 model office chair is perfect for daily computing in the home or workplace. 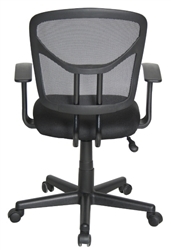 Also available for just $99.99, the E1001 is ideal for smaller chair operators and features a sleek design that's sure to help you maximize your work environment. The simplified design characteristics of the E1001 will resonate with traditional chair shoppers looking to avoid the overly modern seating trends of 2015. The E1001 chair supports users up to 250 pounds and comes standard with the built in lumbar support and 25" 5 star base that we've seen on the other best selling models from this new collection. It's GREENGUARD Certified status, low price point, and ergonomic features will no doubt have it on our best sellers list at the end of the year. The OFM Essentials Seating collection also includes super cool new bar stools! The E2000 series offers plastic seating surfaces that are incredibly durable and easy to clean. Shoppers will love the black, white, and antique white color options available on OFM's quick ship program. Wether you're accenting a bistro, cafe, or break room, the E2000 bar stool is a must consider. As an added bonus, these new bar stools from OFM stack to save space when not in use. Essentials bar stools are available in 2015 for just $115.99 each. If you're purchasing multiple stools for your space, be sure to inquire about bulk discount opportunities with your dealer of choice. We give the new Essentials Seating collection from OFM, Inc. 4 out of 5 stars. The chairs from this new line are comfortable, affordable, and durable. We'd like to see the collection expanded with guest chairs to match the E1003, E1000, and E1001 model chairs. That being said, there's not really much to criticize about this new line from OFM. It just goes to show that you don't have to spend a small fortune to obtain awesome seating for your business.